CCGT power plant valuation has traditionally focused on intrinsic value, the value of dispatching the plant against prices observed in the forward market. Any mention of the extrinsic (or flexibility) value of CCGT assets resulted in nervous glances around the table. Extrinsic value was considered to be icing on the cake. Nice if you could get some, but unreliable and unbankable. With the rapid decline in CCGT generation margins since 2010, Europe is now a different place. CCGT power plant valuation has traditionally focused on intrinsic value, the value of dispatching the plant against prices observed in the forward market. Any mention of the extrinsic (or flexibility) value of CCGT assets, resulted in nervous glances around the table. Extrinsic value was considered to be icing on the cake. Nice if you could get some, but unreliable and unbankable. With the rapid decline in CCGT generation margins since 2010, Europe is now a different place. Support for intermittent renewable capacity has driven down power prices and cheap coal has displaced gas plant from the merit order. CCGT asset values have been written down as a result. But the value of CCGT assets has evolved not disappeared. Intermittency is causing a structural increase in the requirement for system flexibility, in the form of responsive but lower load factor generation. CCGT assets are well placed to service this requirement. 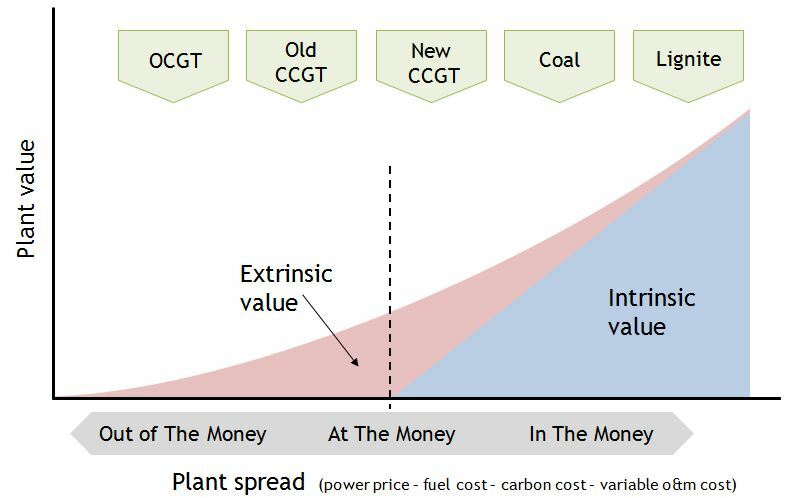 But the extrinsic value from plant flexibility now plays a central role in defining CCGT asset value. The owner of a newer CCGT may still have the ability to hedge some intrinsic value over peak periods, but an increasing portion of asset value is now extrinsic. For older CCGTs, 100% of value is extrinsic. Note: the formula above is for a European gas plant. Conversions (energy and currency) and the consideration of the Carbon Price Floor are required when calculating the clean spark spread for a gas plant in the UK. A CCGT asset is essentially a strip of options on the spark spread. These options can be exercised on a very granular basis over a short time horizon ahead of plant dispatch, e.g. against hourly or half hourly price granularity in the spot market or even finer granularity in balancing markets. But monetising plant value based on short term optimisation alone, usually results in unpalatably high earnings volatility. So where possible, asset owners will typically hedge plant exposures in the forward market. Exposures can be hedged on a forward basis by grouping the strips of plant options into a granularity that matches available forward contracts in the power, gas and carbon market. These forward hedge positions can then be adjusted in response to changes in market prices. The intrinsic value of a CCGT can be monetised with low risk, by hedging generation margin in the forward market and then dispatching the asset to fulfil the hedge. So hedging intrinsic value sets a floor for plant returns (ignoring plant outage risk for the moment). But the plant can also be ramped up to respond to periods where spark spreads move higher and ramped down during periods of zero or negative spreads. Extrinsic value is generated from the flexibility of the power plant to respond to changes in market prices. European CCGTs currently have relatively little intrinsic value at current forward market prices. Sparkspreads range from slightly positive values in the UK, to pronounced negative values in markets like Germany and the Netherlands that are currently suffering from significant overcapacity. In other words the strip of CCGT plant spark spread options is only slightly ‘in the money’ in the UK and well ‘out of the money’ across much of Continental Europe as illustrated in Chart 1. Note: Chart 1 illustrates baseload ‘in the moneyness’ of different assets. Assets can also be hedged on a peakload basis, giving a slightly different picture, although the principles are the same. A lignite plant which is deep ‘in the money’ at current market prices, has relatively low extrinsic value. Lignite plant flexibility is of little value, given healthy generation margins mean the plant is likely to be running anyway. But weak forward generation margins for CCGT assets mean that extrinsic value is very important. Extrinsic value for a plant is highest when it is ‘at the money’ or when the plant spark spread is zero. At this point only small changes in spread are required for the asset to ramp up if the spread goes positive, or ramp down if the spread turns negative. Similarly, small movements in forward prices may open up a spread margin that can be hedged. The key driver of extrinsic value is market volatility. The more volatile prices and spark spreads are, the higher the value of plant flexibility in being able to respond. It is this exposure to spark spread volatility rather than to the absolute level of spark spreads that has historically made CCGT investors nervous about extrinsic value. In periods when either baseload or peakload forward spark spreads are positive, intrinsic value can be hedged to protect the asset owner from downside risk. As forward prices move, the owner can adjust and improve on existing forward hedge positions to increase asset returns. This can be achieved via a rolling intrinsic or delta hedging strategy that monetises forward market volatility. In the prompt horizon approaching real time delivery, the owner can hedge price shape and capture additional value using the flexibility of the asset to respond to volatility in within-day and balancing markets. The extrinsic value of a CCGT is not as easily observable on a forward basis as intrinsic value. There are also a number of practical challenges in monetising extrinsic value which need to be taken into account when quantifying plant value, e.g. market liquidity, risk capital and transactions costs. But monetising the flexibility value of a CCGT does not need to involve speculation or excessive risk taking. UK spark spreads – light at the end of the tunnel?